Hello everybody! I hope you are enjoying your day! 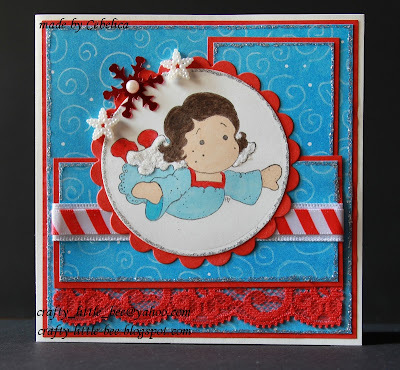 :) When I checked the Stamptacular Sunday challenge blog I found out that my card which I entered in their previous challenge made it to top 3. Yay! I'm so happy! :D What a great start of the day, don't you think so? It's probably because of this that I was in a good mood all day today. He he. 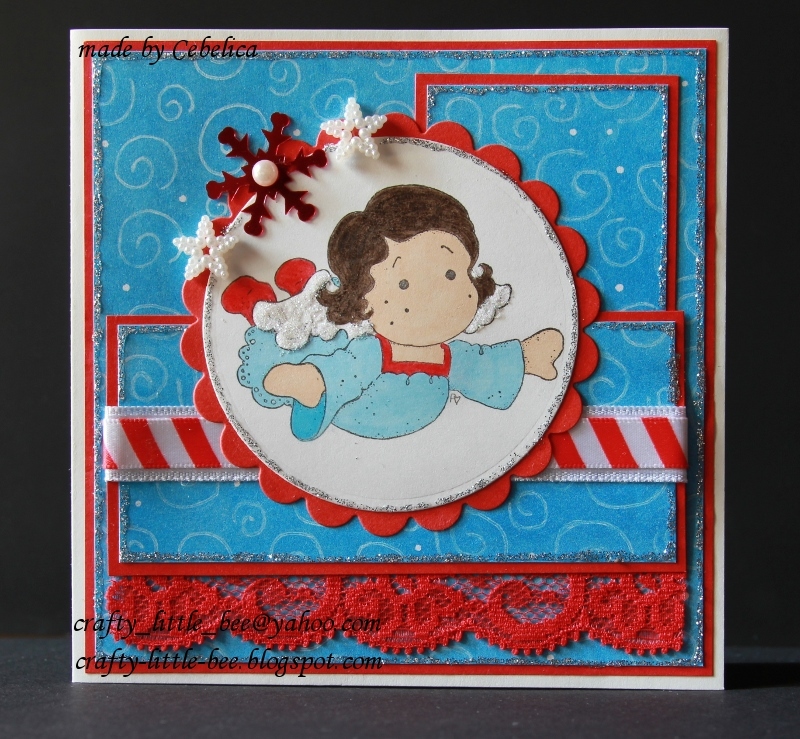 I just used some blue patterned paper from Provo Craft and the yummy red lace which I bought yesterday. I knew it would come handy! :P The ribbons end embellishments are from my stash. I kept this card pretty simple. As you can see I used silver glitter glue on the card and some glitters for Tilda's wings. The image is colored with Promarkers and Faber Castell pencils. As you can see, I also used some Spellbinders dies on this card. Gorgeous, Cebelica! I love those colours! You can also enter it into Sparkle Creations Christmas Cards - anything goes this week! hi cebelica! a beautiful tilda card. i love the colors and your design and of course, who doesent love tilda. Your coloring is great! Love the angel and the snowflakes! Hope you also link this up with Betty Bee's Buzz! Love the texture on her pretty little wings ... the lace is the perfect accent too ... thanks for joining our jingle belles fun. Love your coloring and your color choices! Super cute card. Thanks for joining us at the Alphabet Challenge Blog. Such a festive card, and Tilda is one of my very favorites! I love the Angel image with the puffy wings! Love the blue and red colors, too. Thanks for sharing with us at BettyBee's Buzz! We hope you will come and visit us often! Cute card. Thanks for joining us at the Alphabet Challenge Blog. Ready for another Easter card?